Founded in 2014, the California Criminal Justice Funders Group (CCJFG) is a network of institutional funders and individual donors who invest in a wide range of criminal justice reform efforts in California. As an active learning community, CCJFG members come together regularly to share information, learn from one another and from criminal justice advocates and thought-leaders, create partnerships, collaborate on specific efforts, and leverage our collective capacity on criminal justice issues to enhance our overall impact in the field. 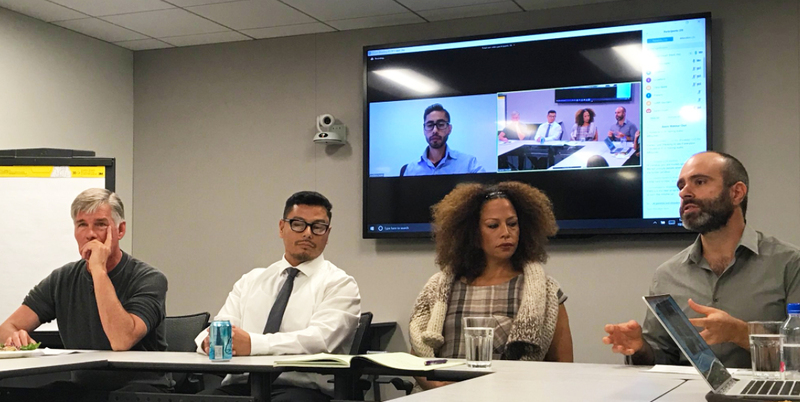 The CCJFG is committed to engaging new funders and partners and leverage new resources to strengthen the effectiveness of the criminal justice reform sector in California. The CCJFG is guided by coordinator Adrienne Skye Roberts and an active steering committee. Whether a visit to a prison or other facility, a webinar or another type of event, the CCJFG invites our members to design and propose dynamic timely learning sessions that may be of interest to the broader group. The CCJFG Steering Committee will vet proposals and select and schedule a number of sessions throughout the year. CCJFG’s coordinator will be available to support the development and implementation of sessions. Criminal Justice programming coming soon. In the meantime, take a look at our past events. Members of CCJFG can log in to see additional resources and discussions. Our criminal justice system is broken. It disproportionately impacts and targets communities of color and poor communities, and costs California taxpayers billions a year, money that could otherwise be directed towards more fruitful investments in community development, drug treatment, mental health services, education, and jobs. This past week, the award-winning hip hop artist and actor Common went behind the scenes in Southern California to better understand our nation’s prison pipeline, and learn from people whose lives are profoundly affected by it both on the inside and the outside. At the end of last year, NCG member Rosenberg Foundation announced that it awarded over $1 million in grants for criminal justice reform in California and the implementation of Proposition 47 (the Safe Neighborhood and Schools Act).